So I am finishing up this book tonight and wanted to give my two cents on it, in case anyone was wondering about it. I saw it in Barnes & Noble when I was looking for “how to” books, that I am somehow addicted to right now. I also kept seeing it pop up in my Fitness and Shape magazines too. Advertising does work! Then a blogger that I follow used it as her June Book Club book, so I figured I may as well see what it’s all about. Like I said, I am really into “how to” books, so this book actually intrigued me. The author spends two years of his life using techniques that people use to be healthier in ALL aspects of life. Some of the techniques to be healthier were a little strange, like running barefoot or wearing “sound proof” headphones around the house, but I recognized a lot of the things he tried out that I have been reading in fitness magazines and health books. Being a science teacher, I like how each chapter focuses on a “body system”, like the chapter on the immune system and the amount of time to hand wash or the whole chapter on the stomach where he focused on being aware of his own chewing for digestive purposes. My kids always ask me ideas on how to take care of themselves, so this book gave me some ideas. I admit is was a little overwhelming. I don’t know how he spent two years and was able to keep everything straight and organized. He was “real” in the sense that he slacked on things and I liked all the humor he used to tell stories. All in all, he pretty much tried every diet, fad, exercise class, doctor’s advice, or whatever people suggested. When I got about mid-way through the book, I started jotting down things I liked and then pretty much skimmed through the things I thought were ridiculous. I could see some people getting bored with it, but since I’m really into trying new ideas, I was excited to make a list of things I could work on. Things I liked: using tiny amounts of salad dressing or no dressing on salads; 60 minutes of exercise a day; setting out gym clothes the night before a workout to motivate; drink a gallon of water a day; get 7 hours of sleep a night; stand and walk around the house more often than sitting (I often type on my laptop from the counter. ); more than 30 grams of fiber intake a day; drinking water with lemon; have one girls day a week (social health); learn a new language; floss daily; get a dermatologist appointment…pronto! ; be aware of my chewing; etc.. Honestly, I don’t know how to review this book. 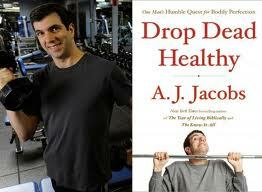 I would recommend it to anyone who is trying to think of ideas of how to be healthier. I don’t think you would want to do EVERYTHING, but it explains concepts that people believe in and then you can take it from there. Pretty much it got me to be more aware of certain parts of my body I never thought needed exercise, like my brain. I could also see people not liking it very much, because it doesn’t have a “story” in it (even though he used his grandfather’s life as a storyline a lot). If you were to read it and lose attention, I would again recommend scanning the book. It definitely reminds us how big the health industry is and all the people out there (including myself) that are desperate to find healthy things to do to improve our bodies. It’s funny how we all are fighting every day to start good habits and break the bad habits we have. That is my life in a nutshell. Question: Did anyone read the book? What did you think of it?